As you can see below, the original recipe calls for this to be baked in the oven. The advantage of that method is that you have some delicious flavorful juices to drizzle over the meat and mashed potatoes. They were fabulous on the grill too. Cut each breast into 3 pieces, season the chicken with the spices, salt, and black pepper. 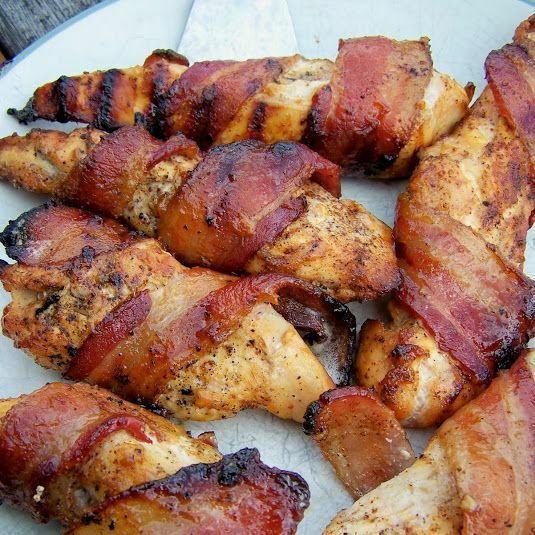 Wrap a bacon slice around each piece of chicken. Place into an ovenproof dish greased with the olive oil. Bake at 400°F for 30 to 40 minutes or until chicken is cooked through and bacon is brown and crispy. 0 Response to "Sweet & Spicy Bacon Chicken"